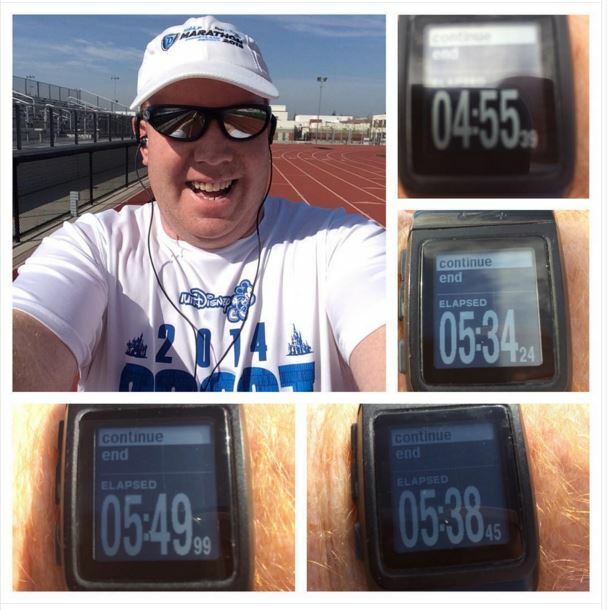 So, this past Sunday, I made it out for my first Yasso 800’s workout ever. On the calendar were 4 of them to complete. I was feeling apprehensive about running these because they were a new workout and this workout is a marathon finish predictor kind of workout. 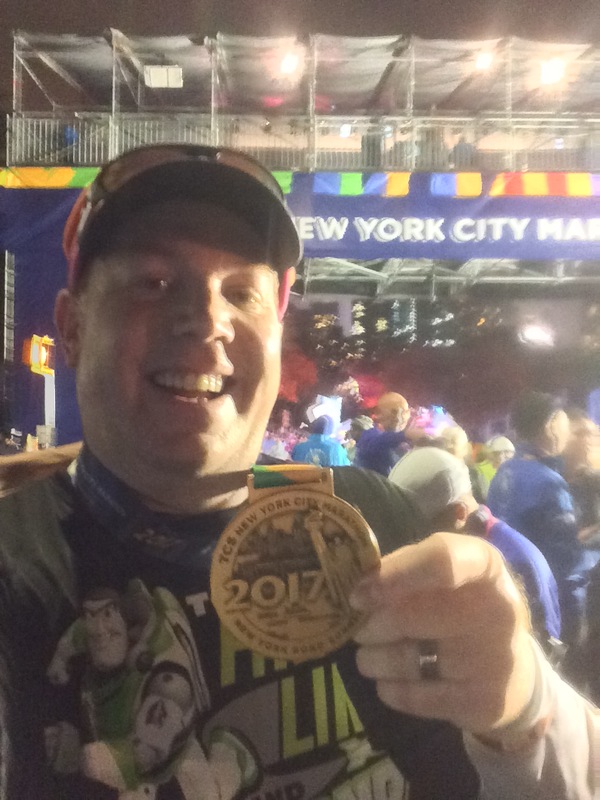 So, it was the first time my goal of a 2:30:00 half marathon was doable or not. 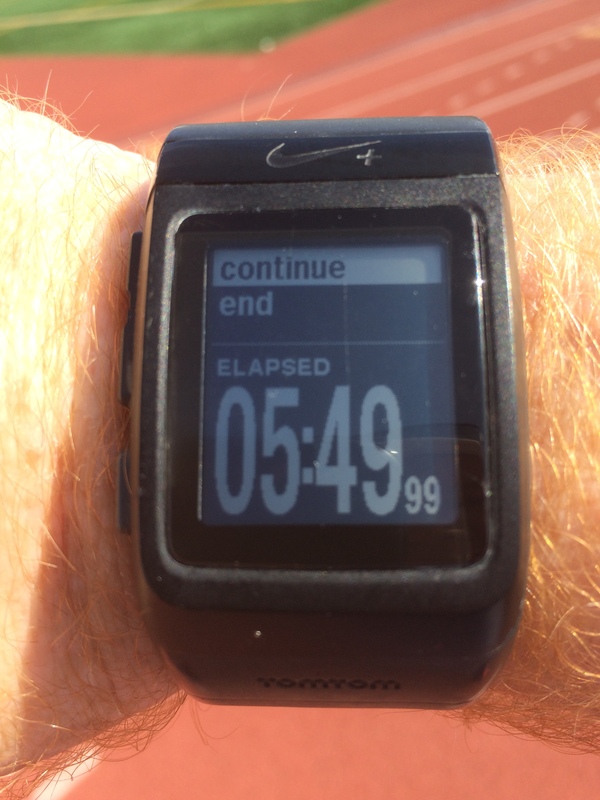 As I headed off to the track, I sincerely hoped that I wouldn’t find myself clocking in at 6 minutes (or even more) for any of the 800’s. That would be devastating and leave me already questioning my goals for Rock n Roll San Diego Half Marathon. On the drive, I tried to come up with a game plan for the day. As a run/walk/runner, the idea of running a half mile without stopping was intimidating. So, I decided to try to run both laps in the first 800 and go from there. I’d see how I felt and make any necessary adjustments. In my mind, I’d run all the way for the first 800 and revert to intervals of either a 1 minute run/30 second walk or a 1 minute run/1 minute walk for the other other three 800’s. 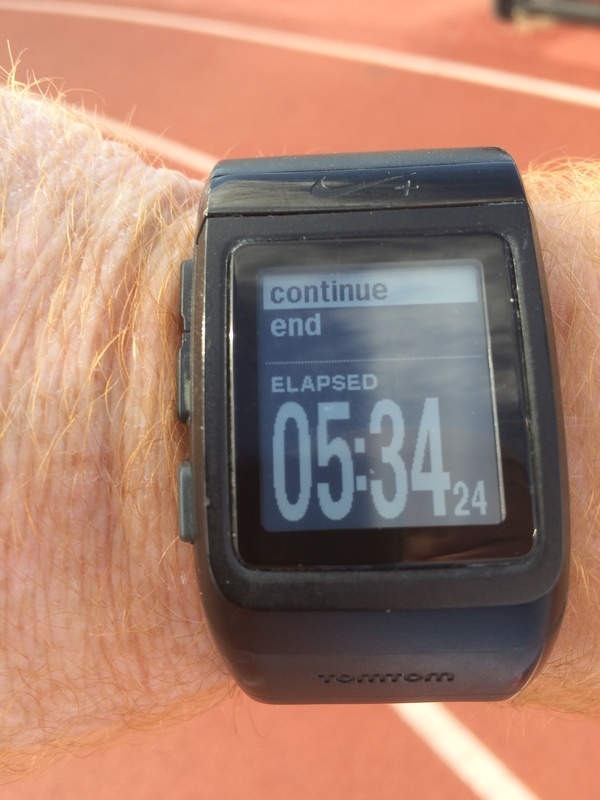 I used the stopwatch feature on my Nike Plus GPS Sportwatch to time all the 800’s. Also, I kept my Nike Plus app going for the entire workout. I figured that it would give me what I needed in this workout to use both. 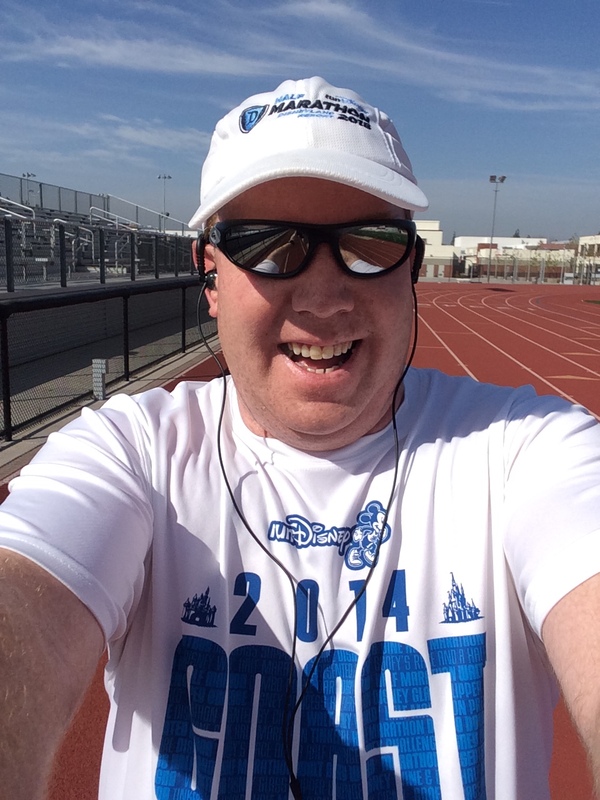 Once I got to the track, I walked the first lap as a warm up. Since I was still a little worried about how it would all turn out, I added a second warm up lap where I threw in some short interval runs. Then, I got the stopwatch up and was off. 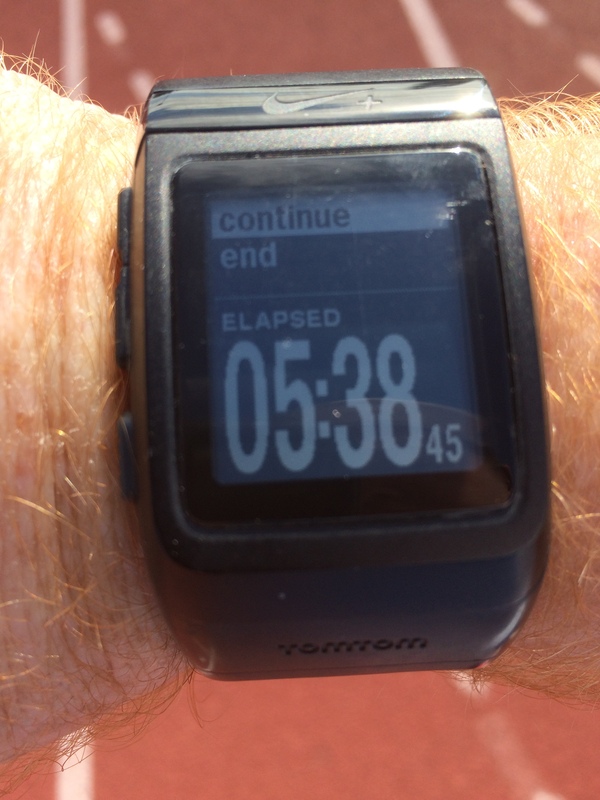 As I got going, it felt good to not be worried about running longer than 30 seconds. I tried my best to keep everything under control. I ran in lane 7. So, I started off in one of the turns on the track. I had no problems heading into the first turn. 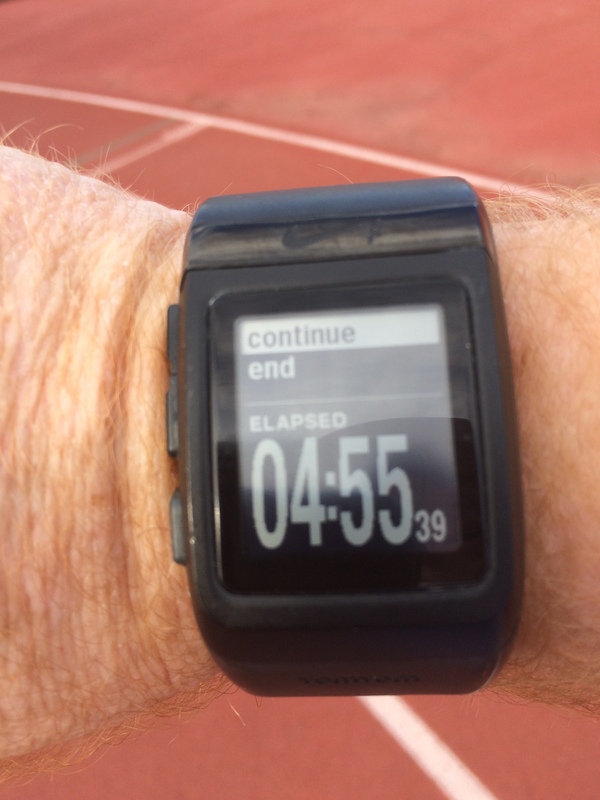 However, I made a mistake in looking at my watch on my way up the final stretch for lap 1. I saw I was at around a minute and a half and it kind of freaked me out. That brought me to a walk. However, the walk was short lived since I was close to finishing lap 1 in around 2 minutes! Motivated by that, my walk break lasted around 20 seconds and I crossed the finish of the first lap in just under 2 minutes! I made my around the next turn, but was brought to a walk in the straight. I kept the walk for around 30 seconds and was off running again. I ran for about another minute to get me close to the finish. With a 10 walk break, I ran to the finish and loved the time! 4:55! That was 15 seconds under the goal I have for these Yasso 800’s. It turns out I went out way too fast. After the first 800, I walked out the lap and tried to recover enough for a repeat. However, I could tell right away that I wouldn’t be able to repeat my first lap. So, as I walked, I decided to try for run 1 minute, walk 1 minute on this 800. Lap 1 went well again. I finished in 2:25! Again, this was well within my goal for the Yasso 800’s. Lap 2 was trying again. I did well around the first turn and the straight after that. However, in the last turn, I was gasping for air pretty badly. As I made my way up the final straight, I had to cut my run to a 30 second run. I tried to recover fast. After a 30 second walk break, I ran to finish the lap. 5:34 was a little disappointing because it could have and probably should have been faster. I felt pretty gassed by the end of this 800 and wondered if I should even try another. By midway around my walk lap, I made the decision to just go for it. After all, this is a learning experience and I needed to see exactly where I was. So, I went with the 1 minute run/1 minute walk again. Much like the other two 800’s, the first lap was completed with no problems. I finished in 2:30 this time. It was a little slower than the 800 before. However, I thought that, if I could just get over the mental problem I had the last time, it would workout okay. The final turn and straight were my undoing again. By the time I got to the final straight, I knew I would finish this 800 slower again. But, I pushed anyways and found a way to finish. 5:38 wasn’t too much slower. However, I had thought I’d finish in 5:35. Oh well. With one more to go, there was no way I’d stop. The last 800 was by far the hardest. I had some struggles even on the first lap. I went through this lap with varying intervals. Honestly, I was in between survival and not wanting to give up too much time. I really didn’t want a 6 minute 800 and that’s what cut some walk breaks short. I really worked for this time. 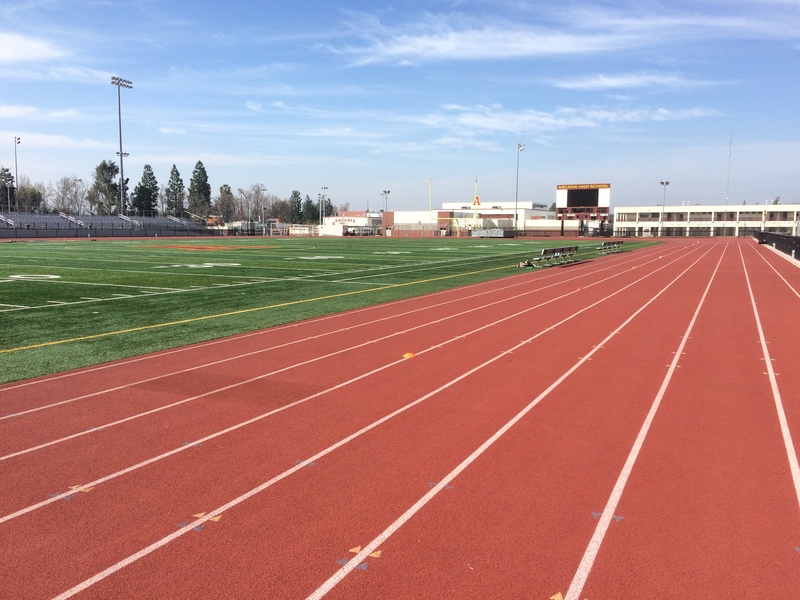 Running 800 meters on a track is so much different than running them on a treadmill. On the treadmill, it’s easy to zone out and not be constantly be focused on how much you have left to run. On the track, it’s hard not to know how much is left. Not knowing helps when I start feeling myself get out of breath. It’s easier on the treadmill to just keep moving through it. I can convince myself that it’s almost over. Just wait a few more seconds before looking down and seeing where I’m at. On the track, I didn’t have that luxury. I could visually see how much was left. That psyched me out more than a few times. I’ve got to adopt that mindset I’ve had on a treadmill when attempting 400’s or 800’s. Take it a few more seconds. Also, on the final straight, I need to stay focused on the finish line and refuse to stop running until I get there. The Yasso 800’s are meant to be run the entire way for 800 meters. So, I have a goal of getting to that point. Even if I can’t do the entire workout running all of the 800’s. I need to make it a sub goal of mine to run as many of them without the walk breaks as possible. I need to carry water with me for future Yasso 800 workouts. I finished the first 800 in a time that was under my goal! That just tells me that it is possible! Running a 5:10 800 is within my ability even now. As I progress in this training cycle and improve my fitness, I think that I’ll get there! Each of the first 2 800’s project me to finish in a half marathon PR time! The third 800 projects me to be really close to a half marathon PR! If I hold to that third 800 time as my Yasso 800’s time when I do 10 of them, it would project for me to beat my 2015 Rock n Roll San Diego Half Marathon time! I can do these 800’s! I left the track feeling amazing about myself. I’m in better shape than I thought I was before. It’s time to take that confidence and build on it. After all, that’s the goal of training for these races. Right? Awesome job out there! Yasso 800s are so tough, but such great training. I sometimes feel more accomplished running them than even my long runs! You have a great track there, good luck! Thanks! Yasso 800’s are tough. I can’t wait to see how it all pays off in the end! I’ve only been to this track twice. Both times, the track was rather empty. I loved that because it makes it easier to get my workout done. Great job – just keep doing them and i’m sure you’ll be running them all non-stop in no time!! Thanks! That is the goal. great job for your first go around! A few suggestions I have learned since starting repeats: 1. carry water like you said 2. your recovery time in between should be the amount of time it took you to do the prior repeat. I found walking for 3 minutes or so and then doing slow intervals to get ready for the next one worked well 3. depending on how many intervals you are doing, you may also need to bring fuel with you just like you would on a run. speedwork is so scary but it really is a great confidence booster! Thanks for the suggestions! I will absolutely keep them in mind for my next time.